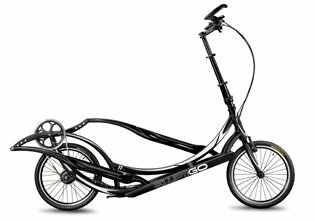 How easy is it to ride an ElliptiGO elliptical bicycle? See the correct posture for riding the ElliptiGO outdoor elliptical bicycle to maximize comfort and performance. The ElliptiGO bike is the the world's first outdoor elliptical bicycle. The ElliptiGO elliptical bicycle enables many former and injured runners to enjoy the physical and psychological benefits of running outdoors, even if they can't run. Propelled by long, running-like strides, the ElliptiGO provides a low-impact, outdoor exercise experience.